Computer models are now coming together on a strong Alberta Clipper headed our way today. The snow has already began to fall and will continue through the night in most places. It will be moisture stricken, but with such a cold air mass holding its own, it will not take much to fluff up several inches of snow. Right now it is looking like a Chicago special, in terms of heavy snow. A broad area of 3-6" can be expected, but a very narrow band of heavy snow will set up likely from Lake Erie to Chicago. 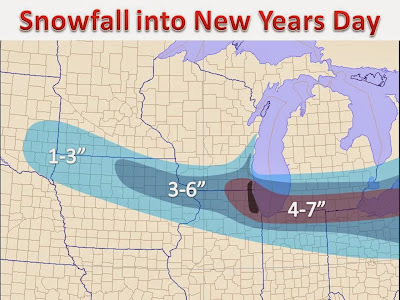 Furthermore, lake enhanced snow will be seen along the SW coast of Lake Michigan where 8,9" is not out of the question. You can follow us on twitter, or like of Facebook page, information for that is on the right side of the page! Happy New Year's everyone!